Lying on the grass the other day, looking up at the blue sky and our towering bamboo, it occurred to me I’ve not really talked much about it. The object of my attention that afternoon was the bamboo we planted the summer we moved into the house. This was both our first bamboo and our first stock tank (we now have 11 stock tanks, 5 of them are full of bamboo). There was an open space between the corner of our house and our neighbor’s garage. We wanted more privacy and decided a screening bamboo would be just the thing. Little did we know at the time, but we would become good friends with this neighbor and end up having many conversations peeking around and through the bamboo. Asking for advice on where to buy bamboo I was told THE place to go was Bamboo Garden. What a fun adventure! We were shuttled around the 20 acre nursery on a golf cart with the resident dog running along beside us. In the end my husband and I couldn’t agree on which bamboo to buy. I wanted the tall black stemmed bamboo (Phyllostachys nigra) and he wanted the shorter larger leafed arrow bamboo (Pseudosasa japonica). In what we thought was a clever compromise we bought one of each. Not so clever after all. Finally 5 years later, they are starting to mingle and I like the way it looks. Up until now the tank looked lopsided and busy. I regretted our compromise every time I looked at it. Why couldn’t we have just picked one and went with it!? Besides mingling the bamboo is also (finally) getting tall. Really tall. The black bamboo can eventually reach 20 to 35 ft tall, although no doubt it will remain a little stunted since it’s growing in a container. The new culms that shot up earlier this spring are close to 15 ft tall. The next opportunity we had to use the bamboo/stock tank combination was later that same year, Labor Day weekend in fact, when the neighbor behind us cut down the wall of laurel that separated our lots. In just 1 day our beautiful green privacy screen was gone. Now we were staring right at an ugly scab of a fence, and for the first time we could look right into her house and might as well have been setting on her deck when she entertained (loud, very loud). This called for not one but three tanks, large tanks. This time we got budget savvy and checked out craigslist for people wanting to get rid of bamboo. We found a nice guy in SE Portland who was digging his up, it was planted in the ground and he was worried about his rowdy toddlers impaling themselves on one of the emerging culms. We bought several small plants from him and carefully planted them in two of the tanks. Unfortunately if he told us what type it is I’ve completely forgot. For the third tank we bought a really big leafed bamboo from Cistus, Sasa palmata. This time around we learned from our previous mistake and even though we wanted a little variety we were smart enough to stick to one type of bamboo per tank. After 5 years these three tanks have completely filled in and provide a wonderful screen from the neighbors behind us. In an interesting turn of events the neighbor who cut down the laurel is long gone, her small house was sold, torn down, and the lot divided. Two very large new homes went in its spot. Thank god the bamboo had time to mature and some of the laurel has returned. Continuing the theme...our final bamboo tank also provides a little shade in our very sunny driveway. A different neighbor but a similar story, we came home one day to discover the Photinia wall that grew along our driveway was gone. The house that had always been there, but we couldn’t really see, was all of a sudden very much there. And the sun! We had never realized just how strong the sun could be on the south side of our house because the tall Photinia had provided lots of shade. Unfortunately since the soil next to our driveway isn’t ours (strange zoning in the 40’s when our homes were built) we couldn’t plant in it, yet now when standing on our back porch (or in the kitchen) we looked right into their backyard. Time to get another tank and more bamboo! Garden Fever to the rescue this time, they were having an end-of-season sale and all bamboo and other grasses were, 30% off! We didn’t waste any time and picked out the largest fullest arrow bamboo (Pseudosasa japonica) specimens they had. Instant green! So that’s how we came to have 5 tanks full of bamboo, a little more privacy, and beautiful green leaves…all year round! And in case you’re wondering, we do have great neighbors we just want to pretend we live in a jungle. Perfect use of bamboos, not only giving you a beautiful screen. Good job they are in tanks though as a few of those would take over your whole garden without a second thought. Glad you shared your bamboo story! I am a bit frightened of bamboo and had been told that it shouldn't be grown in pots so in most situations, I've steered clear of most of it. Question: in the 3rd pic from the bottom I see a very large leaved bamboo left of your Tetrapanax, is this the Sasa palmate? Lovely! I love the 'jungle' that you've created! When we were toodled around the bamboo garden, our guide had so many instructions and warnings about growing it that he nearly scared us off. We then proceeded to kill the one we did buy. It sure looks great in your tanks. Do you suppose you will need to divide it some day? Oh I really love bamboo! The delicate way it moves in the wind isn't matched by many other plants. We have a black one in the ground, but containerized by a trench that we dumped powdered concrete into and then watered. Twenty-plus years later, it's still where we planted it and only had one runner escape. One of our local nurseries specializes in bamboo and has close to a hundred versions to pick from. And one of the local botanical gardens has a big bamboo collection. I can see why you had a hard time picking just one species. I'd want one of everything! Splendid ! I love every one of them , and those nice roomy stock tanks are a great solution for thug-worries. I visited the bamboo dude a few years back with my BILs in a persistent drizzle..thank god the golf cart had a roof. Spiky Obsession, yep. The desire to take over is exactly why they are in tanks. Lauren, yes, the one that you ask about is the Sasa palmate. 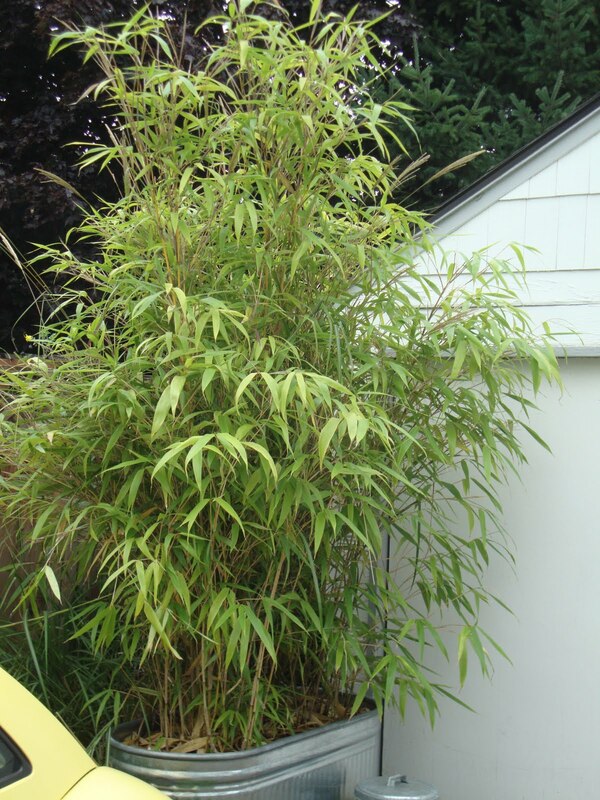 I've heard that mites can be an issue with this type of bamboo, we've never had a problem. I've always thought maybe it's because ours gets more sun than it technically should. ricki, we got a little of that too (warnings and such)...but I chose to ignore most of it. And yes, I fear someday we will have to divide. And I haven't the first clue how we'll do it. Maybe you'll want to come over and help (and take home some free bamboo???). ks, drizzle? Yuck. That would have taken the fun right out of it. Great solution, and I enjoyed the post about how all the bamboo tanks came to be. I'm sure your neighbors are grateful that you consigned the runners to tanks. In central Austin there are entire back yards taken over by bamboo. But in tanks they are perfectly lovely. Don't you hate it when the neighbors decide to change things up a bit? One aimless Saturday project for them, but we end up losing the only shady area to grow brunnera. Loved your bamboo tales. 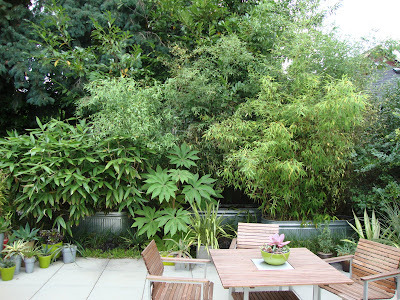 I just love the tetrapanax in the mix there by your patio. Something about the big leaves as a focal point makes everything else shine more. I very nearly got to take a bunch of established bamboos in stock tanks from a neighborhood person who was selling their house. The buyers wanted it removed, but then they came to their senses and kept it. Probably just a well, those things weighed a million pounds. Oh well, I love bamboo so much I planted running bamboo on my property, it was so beautiful! Now, 5 years later we are trying our best to kill it. I spread so fast I would actually wake up at night with panic worries about it. Oh my it spreads fast and oh my it is hard to kill! I would be concerned about the galvanized stock tanks, they will rust out on the bottom. I wonder if the heavy plastic stock/water tanks would be a better idea, not great to look at but safer. They come in all sizes and should last almost forever and one could plant plants in front to hide the tank. Also, Plant Delights Nursery (which I am lucky to only live 5 min. from) sells real clumping bamboo, it REALLY does not spread. I've seen the 20 yr. old clumps they have in their display gardens and they do not run! I wouldn't trust so called clumping bamboo sold elsewhere though, I've seen unscrupulous sellers trying to pawn black bamboo off as clumping, it most definitely runs! Sawzall (in my case, Ryobi battery powered recipro saw) + long Skil Ugly Blade = easy division of running bamboos. The blades are kind of nasty but they work very well. Once they've cut dirt they won't work as well for wood, so save the one you use if there is more division in the future. I know P aurea best; you should leave at least 4-5 culms per chunk for viability though I've had some with 3 survive. YMMV with other varieties. We are thinking of putting bamboo in stock tanks for screening also. I wonder if you drilled drainage holes in the bottom of the tank? How many/ how big? Quentin, we did not drill. The tanks come with a large plug which you can leave in if you want it to hold water, or remove so it will drain. That's all we did. Good luck! Thanks for the post, great photos & descriptions. I considered planting a bamboo privacy screen in metal stock tanks, but thought it would expose the roots to temperature extremes. I live in the SF bay area, zone 8b. Have you had any problems with freezing or very hot days? You're welcome Ray, glad you found the post helpful. Since I'm in Portland, OR, we definitely experience extremes compared to your climate, and I've had no issues with temperatures. And even when snow/ice weighs down the branches they pop right up. I do however have to be sure to keep them plenty watered in the summer. That's the only thing, they dry out super fast and also need more fertilizer than I remember to give them. Really nice bamboo! I plan to arrange a similar setup on my patio. I am kind of nervous about the container size. I believe it is crucial to have a good amount of soil to get a high "leaf mass". I am just wondering how tall your stock tanks are? They really look "full with bamboo" compared to others I have seen. Really great setup! My tanks are 2 and a half feet tall. And regarding your comment of them looking "full with bamboo" I should report that now, six years later, they aren't looking so good. It's difficult to keep them hydrated and happy.